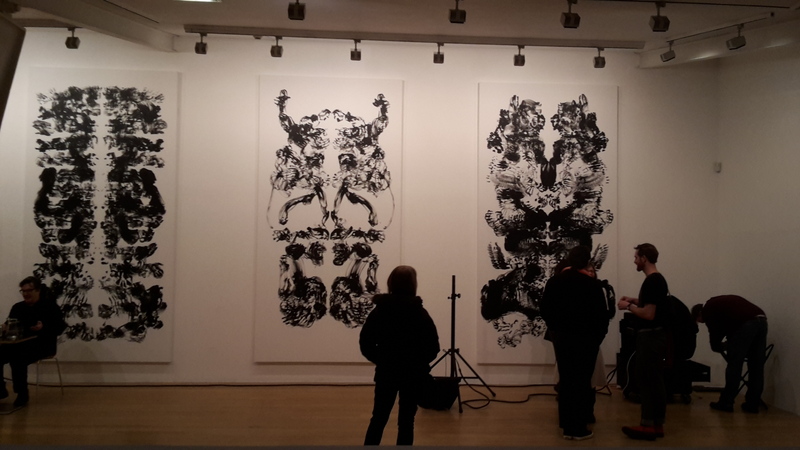 Last night I attended Fruitmarket Gallery’s preview of MARK WALLINGER MARK. It is an unconventional exhibition in the sense that it is split between Fruitmarket here in Edinburgh and Dundee Contemporary Arts, Dundee. I am not particularly familiar with Wallinger’s work, until last night I was only aware of the basic facts. He is an artist who has been creating work since the 1980s and in 2007 he won The Turner Prize with his State Britain installation, a recreation of peace campaigner Brian Holmes’ Parliament Square Protest. This was Mark Wallinger’s second Turner Prize nomination, the first of which occurred in 1995 in response to his A Real Work of Art. History, personal and national identity are some of the themes that run throughout his work. As I was not very familiar with his practice, I found the Artist Talk last night incredibly helpful in my understanding of his artistic oeuvre. I think attending artist talks is one of my favourite things to do, as although you can read and learn plenty about an artist online or from books and journals, nothing quite compares to hearing them discuss their work in person. It is an incredibly intimate moment I believe, for an artist to reveal and describe their process in front of a crowd and so I attend as many artist talks as I can. They are the best way to learn about interpreting both the artist and an artwork. Last night’s discussion between the artist and Fruitmarket Director, Fiona Bradley, was no exception. With a nice introductory discussion of his State Britain work, the talk then led into more recent pieces which included a performance work Wallinger completed in Berlin, as well as his beautiful id Paintings. These were by far the most stunning works in the exhibition for me, mainly because it felt as if I was observing the gestures of a private moment in the studio. It was also a refreshing moment for me to view them in all their tactility and impressively large scale, as seeing them on the website had created a digital interpretation for me. I therefore very much enjoyed studying the studio aesthetic of them in person. Wallinger revealed that they were created during a dark period as he was “not the happiest of people at the time” (notes made during Artist Talk). This to me is evident in the intensity and tactility of the paintings. What I love about them is they are merely traces of a gesture; light and delicate marks of a few studio moments. Wallinger made a total of sixty-six of these, which proves the release he must have felt in their creation. I believe this is evident in the gestures themselves, as they seem to conflict between smooth flowing marks and more frantic, hesitant ones. The show is very much orientated on this notion of mirroring and identity, particularly given the title of the show and Wallinger’s Self Portraits (2007-14) which take the form of the capital letter ‘I’, in various inky renditions on canvas. These are hung on the bottom floor on the same wall that the id Paintings occupy upstairs; a rather satisfying curatorial parallel which again ties into the idea of mirroring. This is furthered by the split format of the exhibition between two cities, the fact the id Paintings are mirror images on either side of the canvas and double the artist’s height, as well as several other features. I sometimes find it difficult to absorb the work fully in a preview environment, as there is the distraction of conversation, constantly flowing movement and of course the bar! However what I love about previews is the conversation and questions that arise in response to the works and how this environment enables people to engage with one another and respond to interpretations. It is always interesting, following these discussions, to return to the exhibition at a later point and view the artwork in contemplation of the ideas that were generated at the preview. To find out more about Mark Wallinger’s exhibition, click here to visit Fruitmarket Gallery’s website. To read and learn more about State Britain, click here to visit Tate’s website.